From Kryolan. 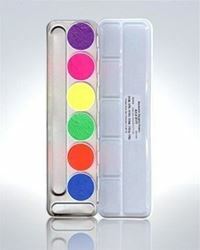 This is the UV DAYGLOW pressed shadow palette of 5. 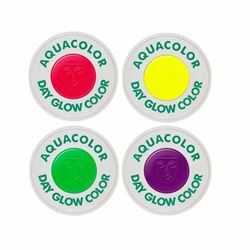 Not to be confused with the aquacolor palette, these are the same traditional UV colors from Kryolan in a pressed powder form. Can be used as eyeshadow, blush, or just a subtle UV shadow. Great for festivals, blacklight parties and more! 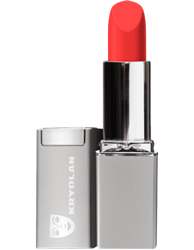 UV Color Stick is based on grease paint in a lipstick mechanism. These grease paints are specially color intensive and glow already under normal light conditions. 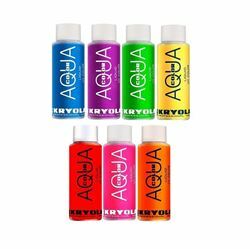 UV Color Stick is universally applicable, for example, for baldness effects and masks to achieve special lighting effects under black light. Application is effortless or can be applied with a brush as well. Setting Spray is recommended if the make-up will be subjected to extreme conditions. 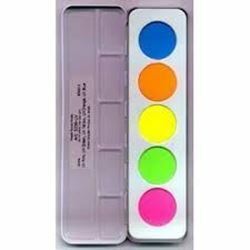 These used special fluorescent pigments are intended for special effects and are not colors in the sense of the German and European Regulation of the European Parliament and of the Council. These products are not intended for cosmetic use, but have been successfully tested in a university hospital for their safety.